Allwell Solutions provide works such as Typewritten OCR, Handwritten OCR, Print OCR, and Cursive OCR, MICR. Our OCR Conversion Process (Optical Character Recognition) translates images of typewritten articles into electronic mode or a picture of characters into a standard encoding scheme representing them in ASCII or text. When it comes to delivering quality OCR services, we have consistently strived to offer you the best by using the complete potential of this innovative technology. Our ICR Conversion Process (Intelligent Character Recognition), our software recognised handwriting scripts and placing fonts and different styles based on the manuscript. By using ICR technology we can offer solutions to convert any handwritten report into a PDF format or word document format. We have the expertise in offering Intelligent Character Reading (ICR) services at very competitive prices. This process converts handwritten text and numbers into machine-readable string and documents. 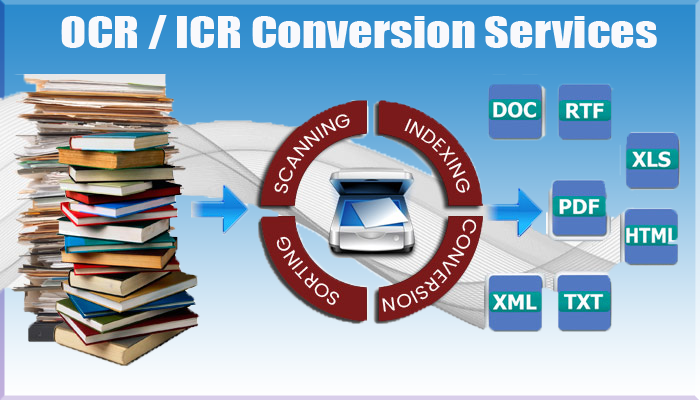 ICR can perform through some applications, and convert handwritten text into PDF files.